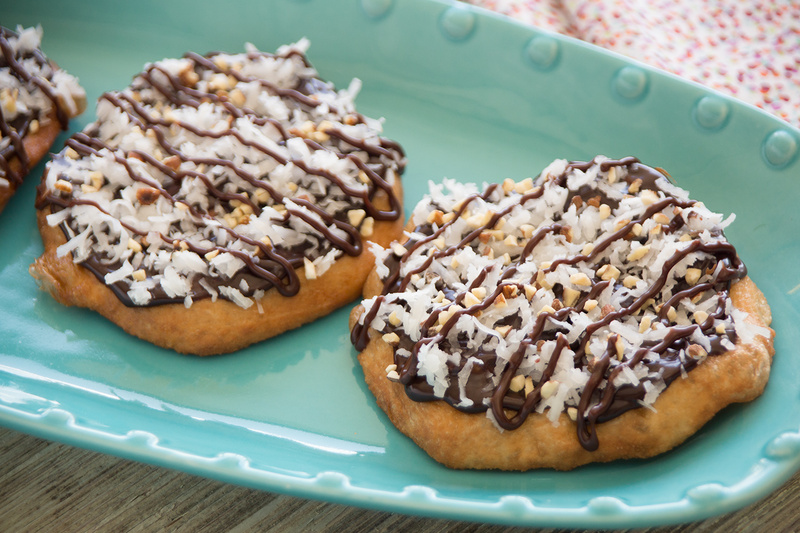 This Fry Bread is topped with the delicious flavors of an Almond Joy! Flatten each roll into a 4-5 inch circle. Cover with sprayed plastic wrap and let rise 30-45 minutes. Heat 3-4 inches oil to medium heat. Remove wrap from rolls and fry each one for 30-40 seconds on each side or until golden brown. Remove from oil and let drain on paper towels. Melt chocolate chips and milk together over low heat, stirring until smooth. Add more milk if necessary to make it the right consistency for spreading. Spread chocolate over fried bread. Top with coconut and nuts. Drizzle with more chocolate, if desired.